The so-called "devil's advocate" in Pope John Paul II's beatification process, who must investigate any possible doubts about the late pontiff's saintliness, pledged Monday to remain objective but hinted that he supported the cause. The Rev. Giuseppe D'Alonzo, the promoter of justice in the Diocese of Rome, said he was neither for nor against beatification for the late pope, whom many considered a saint even before he died April 2. "It's not for me to decide," D'Alonzo said in an interview with The Associated Press in his office, which had a photo of the late pope on the wall. "I must verify the truth." 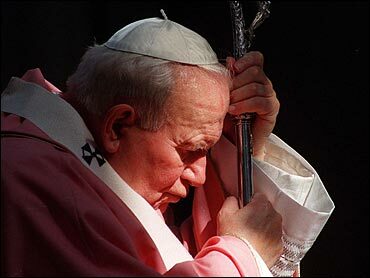 But when asked his personal opinion about John Paul's merits, he conceded: "It's the opinion that ordinary people have, simple people who we all saw in St. Peter's Square when there was the funeral Mass." D'Alonzo was apparently referring to the chants of "Santo subito!" or "Sainthood immediately!" that erupted from the crowd during John Paul's April 8 funeral — calls that prompted new Pope Benedict XVI to waive the traditional five-year waiting period and allow John Paul's saint-making process to begin right away. The cause officially opens Tuesday, when D'Alonzo and all the other officials involved take an oath to keep their proceedings secret and not accept "any type of gift" that might corrupt the process. John Paul himself dispensed with the title of the "devil's advocate" in 1983. The move raised some questions about whether he was merely removing any potential obstacles to his desire to give the faithful as many role models as possible. John Paul beatified and canonized more people than all his predecessors in the last 500 years combined. D'Alonzo said the "promoter of justice" fulfills the same task as the devil's advocate, which is to raise objections and seek clarification about a candidate's virtues. "My job is to try help the judge to find justice, help him dissipate any possible doubts on the person, any difficulties in the cause," he said. "I ask questions about weak points that I have to try to clarify for the cause so it can proceed." He acknowledged that in the past, his role "was seen a bit negatively" as the person who could throw a wrench in a beatification process. But he said that wasn't the case now, that his job was merely "to look for equilibrium in the cause." Once the cause officially opens, two theological experts will gather all of John Paul's published works from before he was pope to determine if they are theologically sound. Meanwhile, a historical commission will gather all of John Paul's non-published works, including letters, manuscripts and personal notes he wrote, to document his life. They will also gather letters, articles, books and other documents written about him — both pro and con — including letters and e-mails sent to the diocese in recent weeks testifying about his saintliness. D'Alonzo and the judge in the case, Monsignor Gianfranco Bella, will then begin interviewing witnesses. If during this process a report of a miracle is deemed worthy of further investigation, officials will consult with doctors or scientists to determine if there is a medical explanation for the supposed miraculous cure. Once all the material is gathered, the Diocese of Rome turns the case over to the Vatican's Congregation for the Causes of Saints, which appoints other theological and religious commissions to study the case and make a final report to the pope, who must decide if John Paul has lived in a "heroic" way human and Christian virtues. If the Vatican then confirms a miracle has occurred after John Paul's death thanks to his intercession, he can be beatified. A second miracle is needed for him to be made a saint.